For shelter there is woodland, gorse thickets, rocky cairns and even abandoned buildings. There is woodland including a remnant of the Caledonian pine forest, streams, rough grazing and moorland for hunting voles and mice. 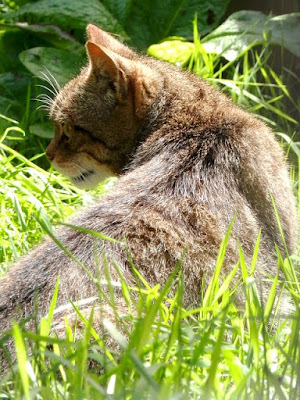 Here in the west there are few rabbits, their favourite prey, in E. Scotland rabbits make up 70 % of the wildcat's diet. As they need to hunt for up to eight hours a day we might find tracks in the snow and the trail camera might find them at night. I have optimistically labelled this Part 1 in the hope that we will get some positive results. do it, I have too many scars from trying to move her. Orphan otter cub rescue on Boxing Day.